ARTICLE 7. This article may be cited as the "South Carolina Physician Assistants Practice Act". Download "ARTICLE 7. This article may be cited as the "South Carolina Physician Assistants Practice Act"." 1 ARTICLE 7. SOUTH CAROLINA PHYSICIAN ASSISTANTS PRACTICE ACT SECTION Short title. This article may be cited as the "South Carolina Physician Assistants Practice Act". SECTION Definitions. 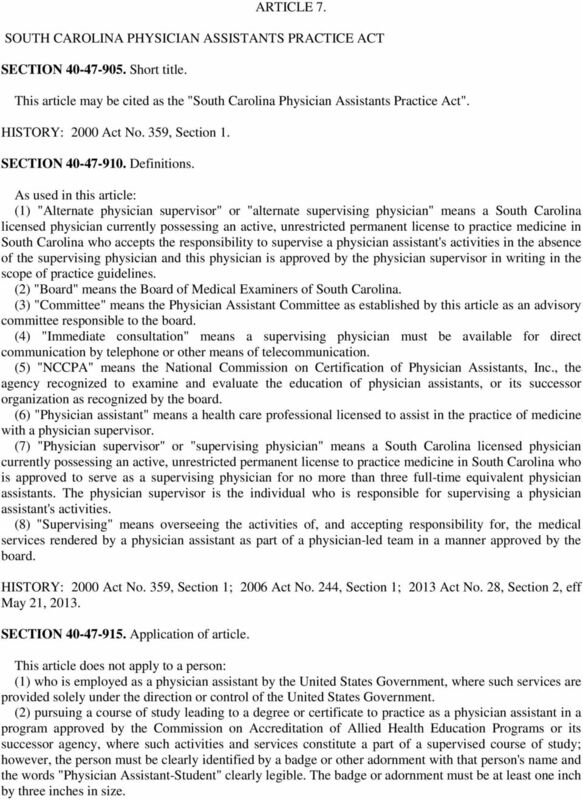 As used in this article: (1) "Alternate physician supervisor" or "alternate supervising physician" means a South Carolina licensed physician currently possessing an active, unrestricted permanent license to practice medicine in South Carolina who accepts the responsibility to supervise a physician assistant's activities in the absence of the supervising physician and this physician is approved by the physician supervisor in writing in the scope of practice guidelines. (2) "Board" means the Board of Medical Examiners of South Carolina. (3) "Committee" means the Physician Assistant Committee as established by this article as an advisory committee responsible to the board. (4) "Immediate consultation" means a supervising physician must be available for direct communication by telephone or other means of telecommunication. (5) "NCCPA" means the National Commission on Certification of Physician Assistants, Inc., the agency recognized to examine and evaluate the education of physician assistants, or its successor organization as recognized by the board. (6) "Physician assistant" means a health care professional licensed to assist in the practice of medicine with a physician supervisor. 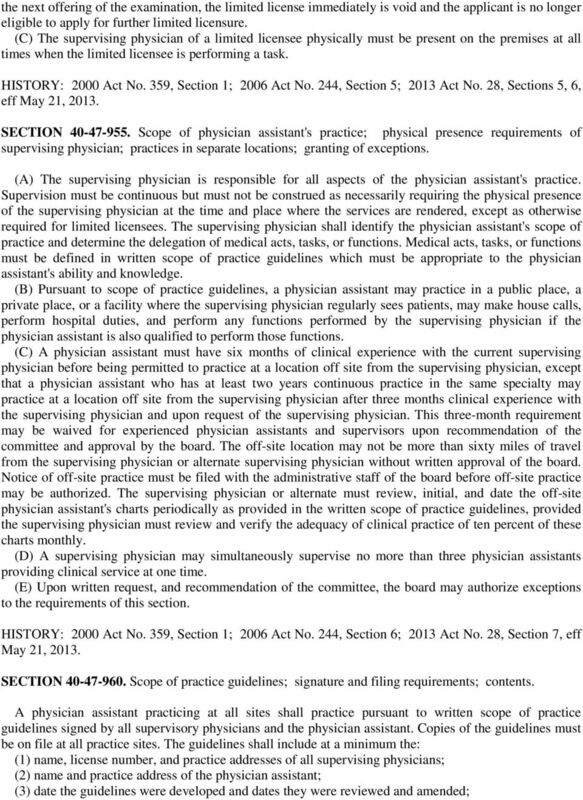 (7) "Physician supervisor" or "supervising physician" means a South Carolina licensed physician currently possessing an active, unrestricted permanent license to practice medicine in South Carolina who is approved to serve as a supervising physician for no more than three full-time equivalent physician assistants. The physician supervisor is the individual who is responsible for supervising a physician assistant's activities. (8) "Supervising" means overseeing the activities of, and accepting responsibility for, the medical services rendered by a physician assistant as part of a physician-led team in a manner approved by the board. HISTORY: 2000 Act No. 359, Section 1; 2006 Act No. 244, Section 1; 2013 Act No. 28, Section 2, eff SECTION Application of article. This article does not apply to a person: (1) who is employed as a physician assistant by the United States Government, where such services are provided solely under the direction or control of the United States Government. (2) pursuing a course of study leading to a degree or certificate to practice as a physician assistant in a program approved by the Commission on Accreditation of Allied Health Education Programs or its successor agency, where such activities and services constitute a part of a supervised course of study; however, the person must be clearly identified by a badge or other adornment with that person's name and the words "Physician Assistant-Student" clearly legible. The badge or adornment must be at least one inch by three inches in size. 8 (d) the physician assistant has directly evaluated the patient; and (e) the written medical order may not exceed a one-time administration within a twenty-four hour period. 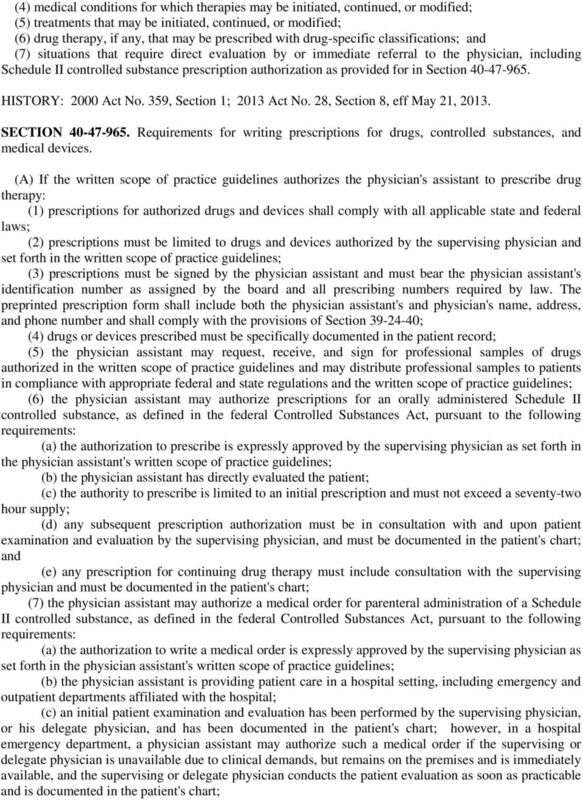 (B) When applying for controlled substance prescriptive authority, the applicant shall comply with the following requirements: (1) the physician assistant shall provide evidence of completion of sixty contact hours of education in pharmacotherapeutics acceptable to the board before application; (2) the physician assistant shall provide at least fifteen contact hours of education in controlled substances acceptable to the board; (3) every two years, the physician assistant shall provide documentation of four continuing education contact hours in prescribing controlled substances acceptable to the board; (4) the physician assistant must have a valid Drug Enforcement Administration (DEA) registration and prescribe in accordance with DEA rules; and (5) the physician assistant and supervising physician must read and sign a document approved by the board describing the management of expanded controlled substances prescriptive authority for physician assistants in South Carolina which must be kept on file for review. Within the two-year period, the physician assistant and the supervising physician periodically shall review this document and the physician assistant's prescribing practices to ensure proper prescribing procedures are followed. This review must be documented in writing with a copy kept at each practice site. 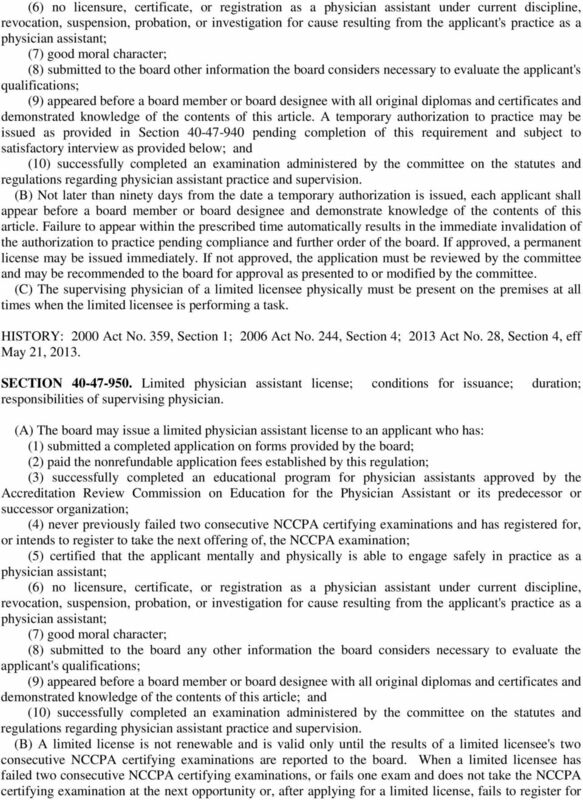 (C) A physician assistant's prescriptive authorization may be terminated by the board if the physician assistant: (1) practices outside the written scope of practice guidelines; (2) violates any state or federal law or regulation applicable to prescriptions; or (3) violates a state or federal law applicable to physician assistants. HISTORY: 2000 Act No. 359, Section 1; 2006 Act No. 244, Section 7; 2013 Act No. 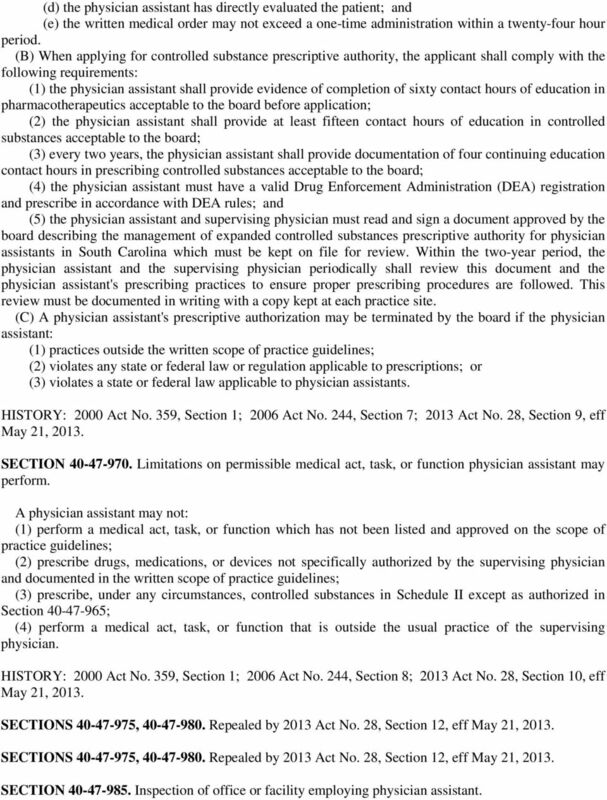 28, Section 9, eff SECTION Limitations on permissible medical act, task, or function physician assistant may perform. A physician assistant may not: (1) perform a medical act, task, or function which has not been listed and approved on the scope of practice guidelines; (2) prescribe drugs, medications, or devices not specifically authorized by the supervising physician and documented in the written scope of practice guidelines; (3) prescribe, under any circumstances, controlled substances in Schedule II except as authorized in Section ; (4) perform a medical act, task, or function that is outside the usual practice of the supervising physician. HISTORY: 2000 Act No. 359, Section 1; 2006 Act No. 244, Section 8; 2013 Act No. 28, Section 10, eff SECTIONS , Repealed by 2013 Act No. 28, Section 12, eff SECTIONS , Repealed by 2013 Act No. 28, Section 12, eff SECTION Inspection of office or facility employing physician assistant. 9 The board or a person designated by the board may make unscheduled inspections of any office or facility employing a physician assistant. SECTION Identification as physician assistant; badge size and content. A physician assistant must clearly identify himself or herself as a physician assistant to ensure that the physician assistant is not mistaken or misrepresented as a physician. A physician assistant shall wear a clearly legible identification badge or other adornment at least one inch by three inches in size bearing the physician assistant's name and the words "Physician Assistant". SECTION Termination of supervisory relationship; notice to board. 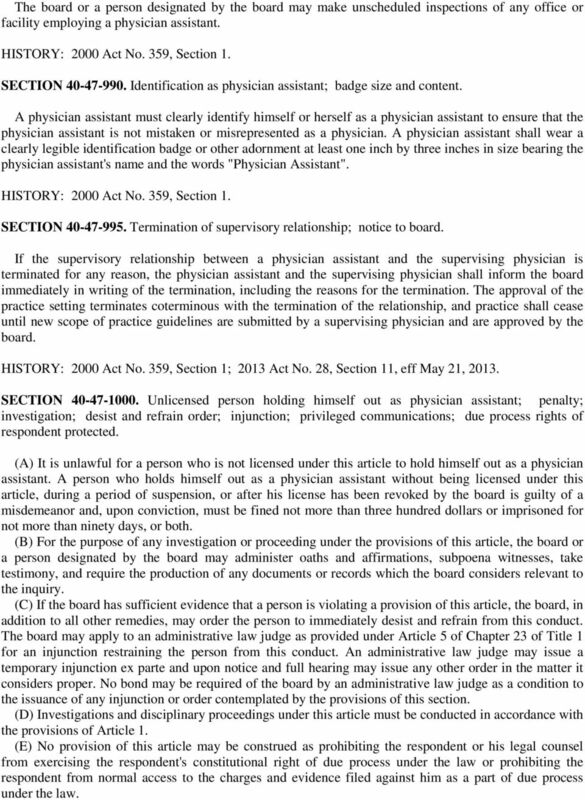 If the supervisory relationship between a physician assistant and the supervising physician is terminated for any reason, the physician assistant and the supervising physician shall inform the board immediately in writing of the termination, including the reasons for the termination. The approval of the practice setting terminates coterminous with the termination of the relationship, and practice shall cease until new scope of practice guidelines are submitted by a supervising physician and are approved by the board. HISTORY: 2000 Act No. 359, Section 1; 2013 Act No. 28, Section 11, eff SECTION Unlicensed person holding himself out as physician assistant; penalty; investigation; desist and refrain order; injunction; privileged communications; due process rights of respondent protected. 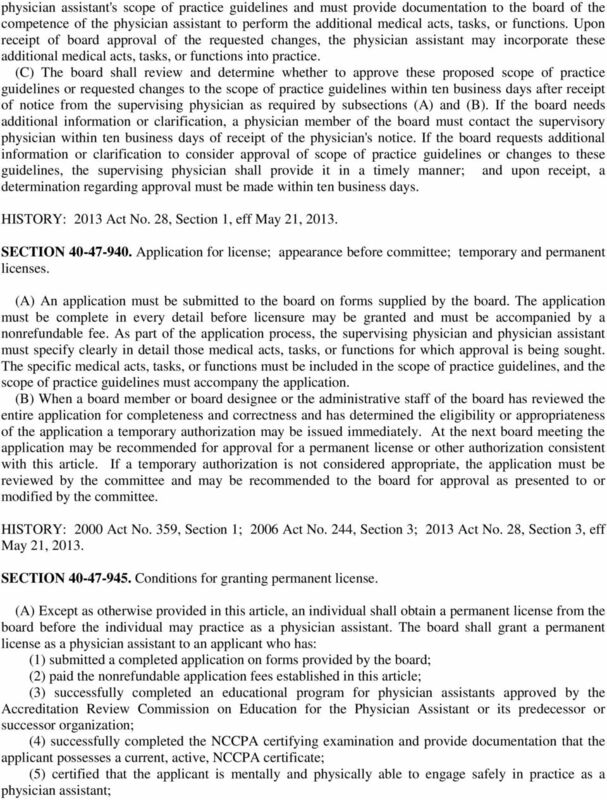 (A) It is unlawful for a person who is not licensed under this article to hold himself out as a physician assistant. A person who holds himself out as a physician assistant without being licensed under this article, during a period of suspension, or after his license has been revoked by the board is guilty of a misdemeanor and, upon conviction, must be fined not more than three hundred dollars or imprisoned for not more than ninety days, or both. (B) For the purpose of any investigation or proceeding under the provisions of this article, the board or a person designated by the board may administer oaths and affirmations, subpoena witnesses, take testimony, and require the production of any documents or records which the board considers relevant to the inquiry. (C) If the board has sufficient evidence that a person is violating a provision of this article, the board, in addition to all other remedies, may order the person to immediately desist and refrain from this conduct. The board may apply to an administrative law judge as provided under Article 5 of Chapter 23 of Title 1 for an injunction restraining the person from this conduct. An administrative law judge may issue a temporary injunction ex parte and upon notice and full hearing may issue any other order in the matter it considers proper. No bond may be required of the board by an administrative law judge as a condition to the issuance of any injunction or order contemplated by the provisions of this section. (D) Investigations and disciplinary proceedings under this article must be conducted in accordance with the provisions of Article 1. (E) No provision of this article may be construed as prohibiting the respondent or his legal counsel from exercising the respondent's constitutional right of due process under the law or prohibiting the respondent from normal access to the charges and evidence filed against him as a part of due process under the law. 10 HISTORY: 2000 Act No. 359, Section 1; 2006 Act No. 244, Section 10. SECTION Misconduct mandating revocation or denial of license. Misconduct constituting grounds for revocation, suspension, probation, reprimand, restrictions, or denial of a license must be found when a physician assistant: (1) has knowingly allowed himself or herself to be misrepresented as a physician; (2) has filed or has had filed on his or her behalf with the board any false, fraudulent, or forged statement or documents; (3) has performed any work assignment, task, or other activity which is not on the physician assistant scope of practice guidelines; (4) misuses alcohol or drugs to such a degree to render him or her unfit to practice as a physician assistant; (5) has been convicted of a felony or a crime involving moral turpitude or drugs; (6) has sustained any physical or mental disability which renders further practice dangerous to the public; (7) has engaged in any dishonorable or unethical conduct that is likely to deceive or harm patients; (8) has used or made any false or fraudulent statement in any document connected with practice or licensure as a physician assistant; (9) has obtained or assisted another person in obtaining fees under dishonorable, false, or fraudulent circumstances; (10) has violated or conspired with another person to violate any provision of this article; or (11) otherwise demonstrates a lack of the ethical or professional competence required to act as a physician assistant. SECTION Renewal of license. A license issued pursuant to this chapter may be renewed biennially or as otherwise provided by the board and department. A person who has not demonstrated continuing education, as required by this article, is not eligible for issuance or renewal of an authorization to practice. HISTORY: 2000 Act No. 359, Section 1; 2006 Act No. 244, Section 11. SECTION Fees for licensure. (A) Fees for physician assistant licensure are established as follows: (1) initial licensing fee, not to exceed five hundred dollars; (2) renewal of license fee, not to exceed one hundred and fifty dollars; (3) late renewal fee, not to exceed the renewal fee doubled; (4) reactivation application fee, not to exceed two hundred dollars; (5) change in supervisor fee, not to exceed one hundred and fifty dollars; (6) additional primary supervisor for dual employment fee, not to exceed one hundred and fifty dollars. (B) Fees may be adjusted biennially pursuant to Section to ensure that they are sufficient but not excessive to cover expenses including the total of the direct and indirect costs to the State for the operations of the committee. HISTORY: 2000 Act No. 359, Section 1; 2006 Act No. 244, Section 12. 11 SECTION Third party reimbursement to physician assistant. Nothing in this article may be construed to require third party reimbursement directly to a physician assistant for services rendered. 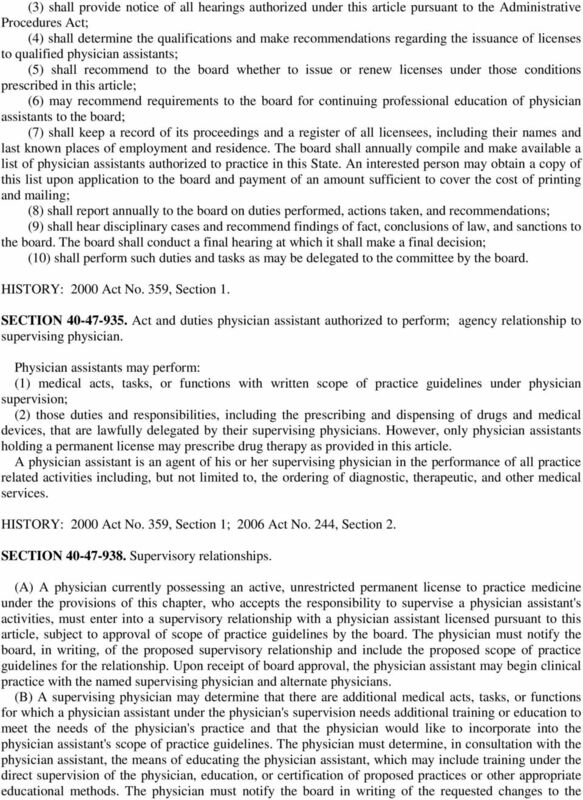 11/01/15 STATE OF OKLAHOMA PHYSICIAN ASSISTANT ACT Title 59 O.S., Sections 519-524 INDEX 519. Repealed 519.1. Short title 519.2. Definitions 519.3. 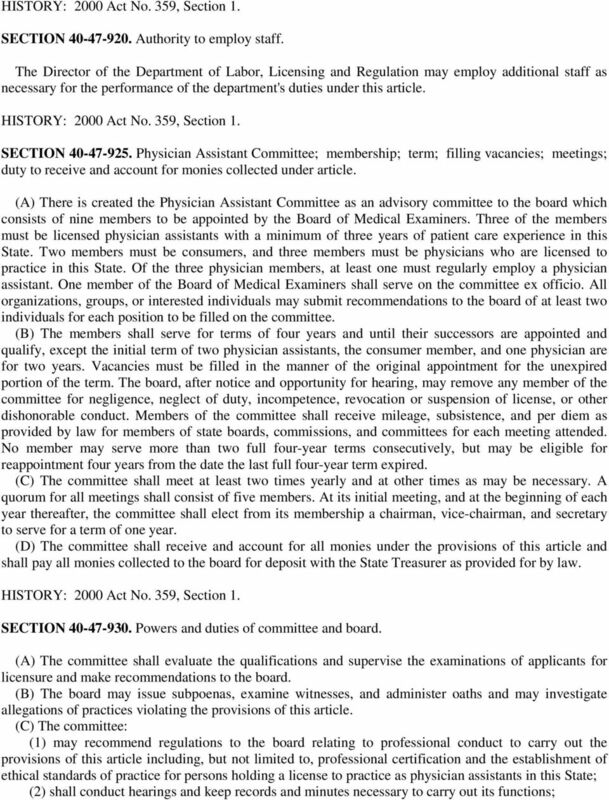 Physician Assistant Committee--Powers and duties 519.4. CHAPTER 378 NURSING Section 20-87a. Definition of "nursing", "advanced nursing practice" and "practical nursing". Chapter 44a Nurse Midwife Practice Act Part 1 General Provisions 58-44a-101 Title. This chapter is the "Nurse Midwife Practice Act." Enacted by Chapter 187, 1994 General Session 58-44a-102 Definitions. 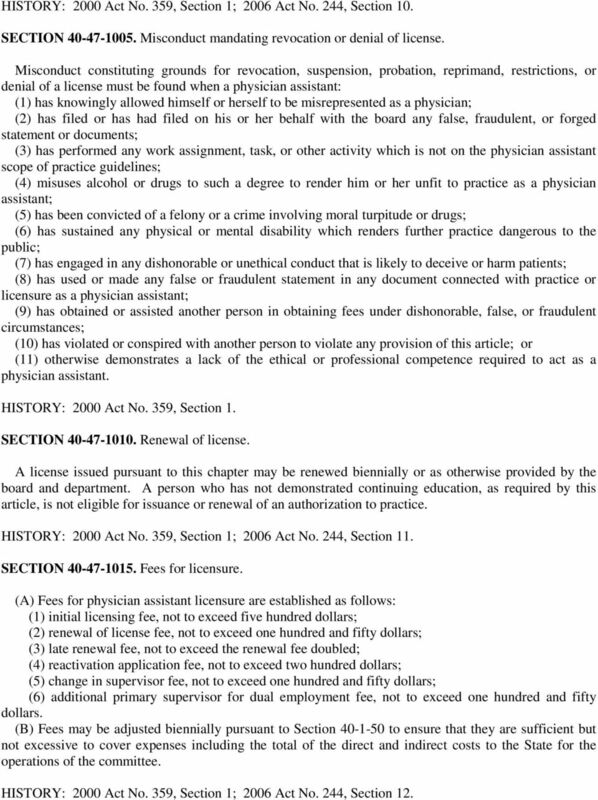 NEW MEXICO NURSING PRACTICE ACT CHAPTER 61 ARTICLE 3. 61-3-1. Short title. Chapter 61, Article 3 NMSA 1978 may be cited as the "Nursing Practice Act". LEGISLATURE OF THE STATE OF IDAHO Sixtieth Legislature Second Regular Session 2010 IN THE HOUSE OF REPRESENTATIVES HOUSE BILL NO. GENERAL ASSEMBLY OF NORTH CAROLINA SESSION H 1 HOUSE BILL Short Title: Establish Music Therapy Practice Act. (Public) Sponsors: Referred to: Representatives Insko, Rapp, and Keever (Primary Sponsors).